Macau, the Portuguese colony forty miles across the Pearl River delta from Hong Kong had a surprisingly long aviation history despite no land based airfield or aerodrome until the 1990s. After visits by travelling American showmen-balloonists demonstrating vertical flight in 1891, it was not until 1920 that French born local entrepreneur Charles de Ricou revealed ambitious plans to start an airline by the name of the Macau Aerial Transport Co. This was to link that city with Hong Kong and others in southern China and the region. Despite procuring several seaplanes, American pilots and ground crews, the project failed when de Ricou incurred the wrath of the Portuguese colonial authorities which bankrupted him. Apart from several resident Portuguese Navy float-planes, and occasional aerial record-breakers arriving from Europe, all remained quiet in Macau which suited the colony very well. In 1935, Macau suddenly came into the aviation spotlight as the alternative terminus for the Pan American Airline’s trans-Pacific Clipper flights from San Francisco via the Pacific islands and Manila. The airline’s planners had sought a terminus at Canton to enable their Clippers to link up with their associate company, the China National Aviation Corporation’s, flights from Shanghai. However, the Chinese government’s policy of barring foreign airlines operating in Chinese airspace in order to inhibit Japanese aerial expansion on the mainland thwarted Pan American’s plans. Hong Kong was also barred to the airline as no British airline had yet flown to the colony, and there were issues on reciprocal rights of access for British airline expansion plans to parts of the world under American influence. By the time the Clipper’s Pacific service had become established to Manila with some exploratory flights to Macau and Hong Kong, the politics had changed. Access to Hong Kong was welcomed in 1936, along with landing permission for CNAC, enabling Pan American’s passengers to transfer directly to connecting flights to and from Shanghai. After 1936, some flights from Manila continued to briefly visit Macau, but the real terminus was now Hong Kong. The Portuguese enclave resumed its somnolent backwater status. After the hostilities of World-War-Two had subsided, a new airline, Cathy Pacific, became established in Hong Kong. Its founders became aware of the activities of Macau’s Banco Nacional Ultramarino during discussions with Roger Lobo, the son of their Chater Road office’s landlord. The family firm of P.J. Lobo were the acting agents for the Bank. At this time there was an embargo on the movement of free bullion (gold & silver) formulated by the International Monetary Fund and known as the Bretton-Woods agreement. This effectively barred signatory countries from dealing in or importing gold in an attempt to bring stability to the world’s volatile monetary systems after the upheavals of WW2. Portugal had not signed, and its colony Macau became the region’s premier unregulated melting pot in the wheeling and dealing in this much sought after metal. After the crash of a Thailand based C47 Dakota airliner into a Hong Kong hillside scattering gold all around the wreckage, Cathy’s founders convinced their landlord to use them to fly Macau’s gold safely, high above any eager robbers and bandits. But, with no airfield in Macau, on their inaugural flight they attempted to fly VR-HDA, Niki, a C47 Dakota onto the racecourse, the only piece of open ground available. The aircraft clipped the seawall damaging its undercarriage causing a belly-landing. This put the aircraft out of commission for several months, and highlighted the unsuitability of the landing ground. 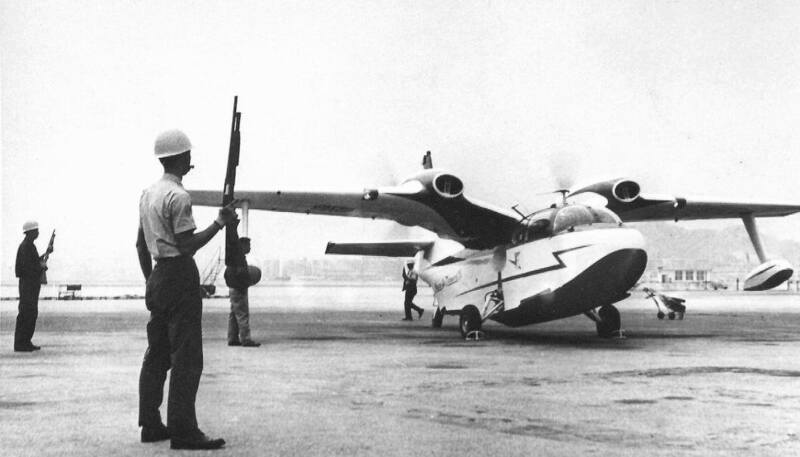 The day after the crash, Cathy’s Roy Farrell dashed off to the Philippines to buy war surplus amphibious Catalinas’ to fly on the gold contract. From 1948, the Catalina aircraft operated under the Macau Air Transport title as a homage to de Ricou’s moribund project. These operated for several years transporting passengers and more fruitfully gold to and from Macau and other cities in the region. At this time, passage for most to visit Macau was by vintage steam-powered ferries commanded by European marine veterans of the China coast along with Chinese crews. Leaving from Hong Kong and Canton, the ferries were taking around four hours or more for the journey. The story of Cathy Pacific/MATCO’s Catalina years has been covered in the books of Captain Charles Chic Eather who was with Cathy Pacific at the time and therefore not covered in this text. However, a Catalina returning from Macau was hijacked by Chinese bandits in July 1948 and crashed into the Pearl River estuary killing all on board except one hijacker. Some references claim this to be the world’s first aerial hi-jacking, but this is debatable. In the late 1950s, a surviving MATCO Catalina was still in use carrying gold and freight between Hong Kong, Macau and regional cities. In 1960, in the British colony, a reconstituted Macau Air Transport Company (HK) Ltd. now lacking the original Cathy Pacific Airways founders had prominent Macau citizens, Roger Lobo and Stanley Ho as prime shareholders. They ordered a brand new aircraft via Jardine Engineering on 28 November 1960. This was a Piaggio P136-L2, amphibian from Italy, registered in the colony as VR-HFP, with the construction number 243. In January 1961, it was revealed in the local newspapers that a new aerial service to Macau would start in March as the authorisation notification had just been published in the government gazette. The license was for three years. Mr R.H. Lobo, the managing director of MATCO stated that as a start, the twin-engine Piaggio amphibious aircraft having a capacity for six passengers would be used on the route. Taking only 15 minutes, the company expected to operate four flights a day carrying both passengers and freight. But it was not until 8 April 1961 that the small 2.2-ton weight ivory and red Piaggio arrived in Hong Kong as deck cargo on board the MS Triton. The aircraft with a wingspan of 50 feet and 35 feet long, was fully assembled and covered by canvas sheeting to protect it from sea spray and the weather. 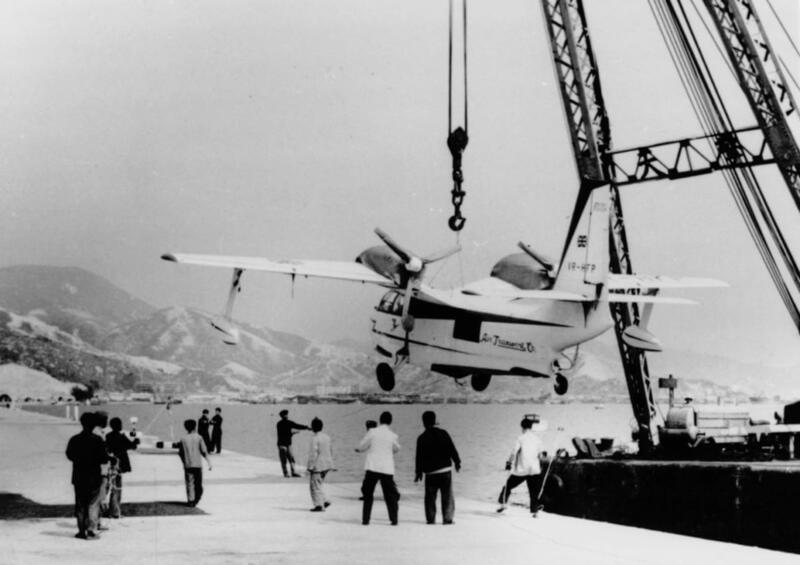 After being unloaded at the Kowloon Wharves, at noon it was transported by barge around to the seawall at Kai Tak airport to be lifted onto land by a floating crane. The unloading at Kai Tak was witnessed by a large group of people including the designated commissioning pilot Captain Len Cosgrove who had test flown the aircraft in Italy along with his colleague Captain Ambrose Tai. Cosgrove had plenty of flying boat experience having been an RAF Short Sunderland pilot with 88 Squadron based at Kai Tak. He told newspaper reporters that there would be four flights a day, six days a week, with no flights on Tuesdays. There was to be a service at 9 a.m., followed by others at 10.40 a.m., 1.30 p.m. and 3 p.m. These could be increased to six services a day claimed the Captain, and the company was prepared to invest in more aircraft if the service was successful. The proposed fares were HK$50 one way and HK$100 return. This aircraft was rather innovative for Hong Kong in having a cranked gull-wing carrying two engines operating in the pusher mode with the propellers behind the wing. This had the advantage of less vibration and noise transmitted to passengers and crew. It was powered by super-charged Lycoming engines, each of 340 horse-power, giving the aircraft a top speed of 180 mph. 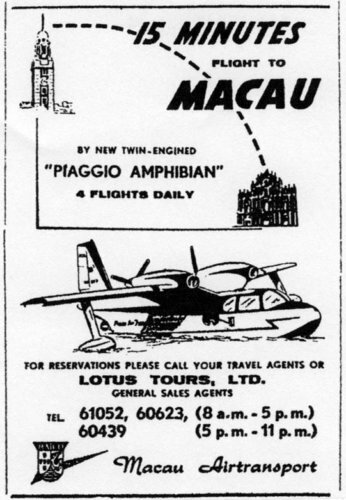 By June 1961, four flights daily to Macau in the Piaggio were being advertised in the newspapers by Lotus Tours Ltd, the sales agents for MATCO. The flights became known colloquially as The One Cigarette Hop, this being the time to smoke one in those less enlightened times. The Macau terminal used the ramp and facilities originally constructed by Pan American Airways in preparation for receiving the China Clipper flights from San Francisco. However, in October 1961, MATCO’s managing director, Roger Lobo announced that the MATCO service was being suspended from December 1st due to poor landing conditions at Macau’s harbour. He told a reporter that the water at Macau was getting shallower every day, due to the heavy silt circulating in from the Pearl River delta. He added; “we are negotiating with the Macau government either for better dredging of the harbour or the building of a runway. After the service has stopped we may consider charter flights but we would only resume regular flights only if there were improved landing conditions.” Mr Lobo denied that a lack of passengers had forced the suspension claiming that many local businessmen and tourists used the service. While the Lobo family had operated one of Macau’s original casinos for many years, Stanley Ho was awarded a new gambling franchise on 19 December 1961 to be based at his new Lisboa Hotel, effective for eight years. 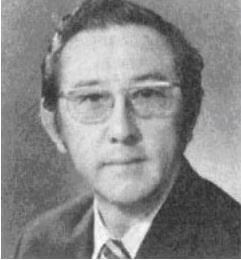 Although he was associated with MATCO, Stanley Ho revealed on 20 December 1961 a plan to introduce helicopter ferry services between the colonies. These did not materialise, but a number of Swiss/Italian fast hydrofoils were introduced to substantially reduce journey times by sea and keep fares at an affordable cost. 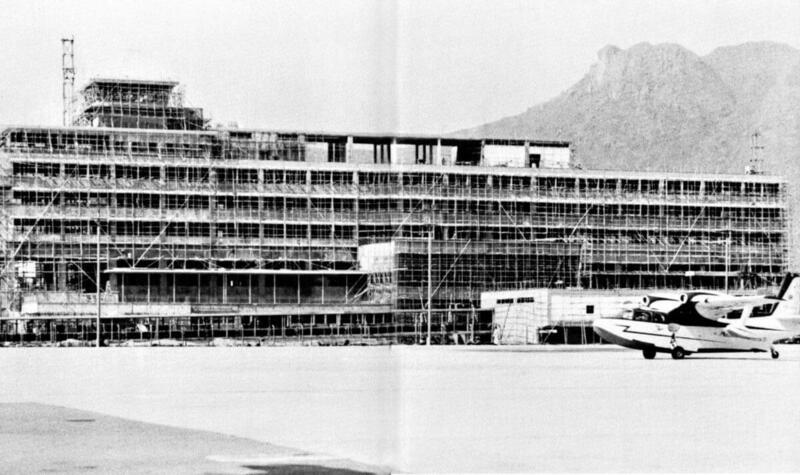 In February 1962, as the outgoing Governor of Macau, Lt.-Colonel Jaime Silverio Marques left the colony he revealed to newspaper reporters that within new development plans expected to transform Macau into an enterprising tourist destination, was the construction of an airfield on Taipa Island. This was to be capable of accommodating aircraft the size of C47 Dakotas. The Hong Kong press on 2 December 1962 reported that the Piaggio had left for Macau with a cargo of gold bullion. In 1964. the official Hong Kong government annual report listed the MATCO service as still operating. The last scheduled service was reported in a government Civil Aviation Department report as having ended on 29 January 1965. 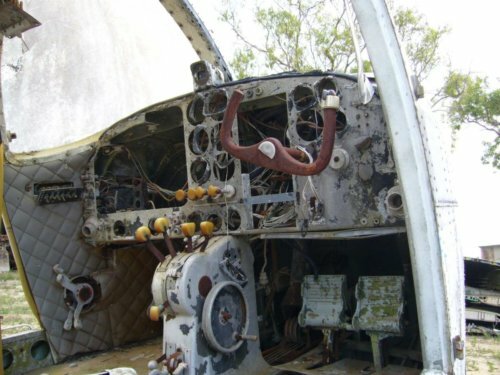 However, the aircraft remained on the Hong Kong register until 1967. The company in its separate Hong Kong and Macau entities eventually filed for voluntary liquidation on 12 November 1968 having transported over ten million fine ounces of gold in and out of Macau without losing a grain. Ultimately far more gold had been moved through Macau than could ever have been legitimately used by its small number of citizens. After two years of idleness, by October 1967 the aircraft had moved to Dili in East Timor, another small Portuguese colonial outpost in the Far East where it was registered CR-TAM and operating under the title of Transportes Aereos de Timor. It had been transferred by Stanley Ho who had plans to expand his burgeoning casino business to there. The Piaggio apparently led a leisurely life in the territory and after a long lay-up was withdrawn from service before purchased by a businessman from Melbourne, Australia. It was moved to Essendon airport near Melbourne on 20 April 1972, arriving in a silver finish and large black registration lettering. Refurbishment work was carried out by Executive Air Services who painted it white. Meanwhile, re-registered as VH-BJP it was christened the ‘Ruptured Duck’ by new owner, Bill Jane. The amphibian was subsequently moved to Townsville in northern Queensland for services with Dolphinair between Townsville and Hinchinbrook Island. However, on its inaugural flight on 19 October 1974 it was damaged while landing at the island and sank off Cape Richards without loss of life. The now salt laden aircraft was salvaged but deemed to be a write-off. 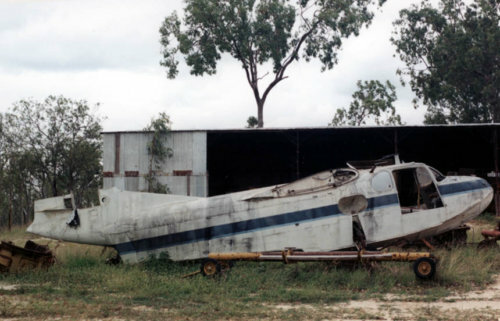 It ended up with an ex-Hong Kong registered Stinson light aircraft at Syd Beck’s Military Museum, at Mareeba in the Highlands near Cairns where its substantial remains can still be seen today. This location was used by a USAAF bomber wing during WW2 and is now the home of the North Queensland Warbirds chapter. Stanley Ho’s hydrofoils continued to run in parallel with a variety of old ferries during the 1970s, when the much faster and higher capacity Boeing jet-foils were introduced. These were followed by a large number of types of catamaran fast ferries as the old conventional ferries were retired. The 1961 proposal by Stanley Ho for helicopter operations did not get off the ground until 21 November 1990 when East Asia Airlines started operating frequent twenty-minute services between heliports on the top of the fast-ferry piers in Hong Kong and Macau. 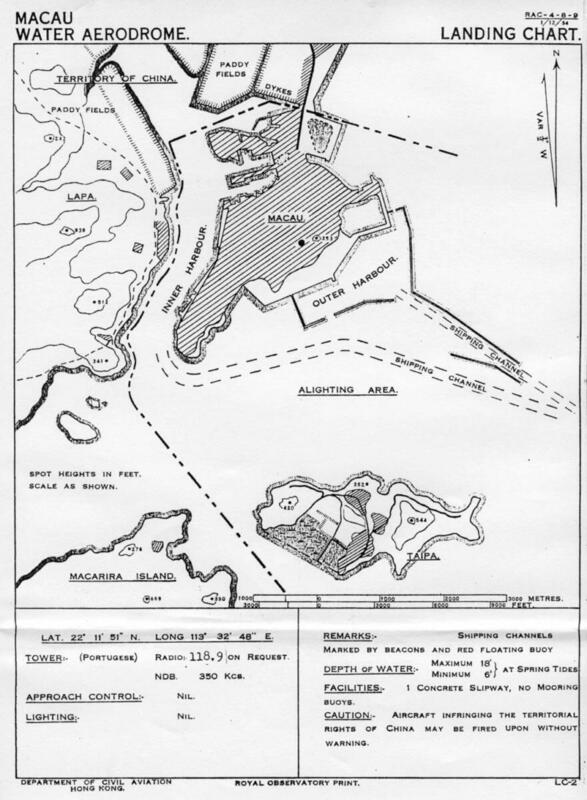 Likewise, the plan for an airport for Macau revealed in 1961 did not materialise for another forty years. After a long gestation period during the late 1980s and 90s, Macau’s international airport was finally inaugurated on 8 December 1995. With the ongoing massive developments in the casino and hospitality industries there, the future for aviation in Macau is now very bright indeed. This article was first posted on 9th September 2016.